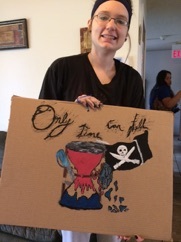 I delivered workshops for The Villages, an organization that provides emotionally supportive homes to delinquent youth in need, with one workshop culminating in an exhibition at the Fairlawn Plaza Art Gallery. 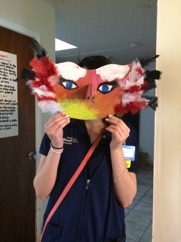 Participants could pick from a range of projects, one of which was related to the work of sociologist Erving Goffman, who contended that we create masks of our interactions, and these masks are our truer selves because they are the selves we are striving to become. With this in mind, participants were asked: What would your mask look like if it was a large self-portrait symbolizing who you want to be? 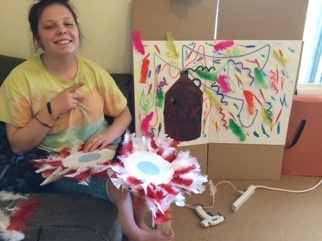 I’m working on a project spearheaded by Washburn University’s Department of Criminal Justice and Legal Studies, the Department of Theater, and the Mulvane Art Museum that offers female prisoners a chance for self-expression, assists with therapeutic practice, aids re-integration, and facilitates networking support. The project will culminate in a curated exhibition at the Mulvane in the Spring 2017, with the potential for a bound book on inmate art. For the last nine years the Art Department has hosted HSAD, a two-part event in which approximately 150 advanced high school art students from over 15 regional high schools exhibit their work at Washburn University, and also participate in a day-long conference in which they are immersed in studio art and art history workshops led by university Art Department faculty, colleagues, and Upper Division art students. As the Catron Professor of Art, I prepare a realistic annual budget and manage all aspects of planning the exhibition and the conference workshops. -Initiate a call for entries of student work throughout the region’s high schools. 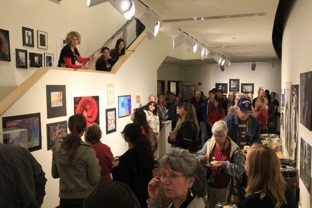 -Ensure delivery of 2D and 3D art work and curate the exhibit in the Washburn Art Gallery. -Publicize the exhibition and host its opening reception. -Ensure the show is judged and awards are prepared for deserving students. -Take down the exhibition and arrange for pick-up of student work. -Schedule workshop topics, times, and locations and provide guidance and reminders to presenters. 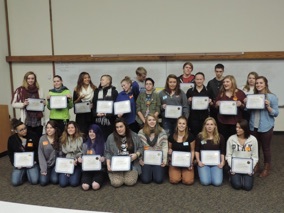 -Market the conference within the Topeka School District. -Oversee printing of conference schedules, campus directions, and evaluation forms, and ensure assembly handouts. -Coordinate with catering on receptions. -Prepare student workshop schedules and manage registration. -Ensure AV equipment and art materials are provided for presenters who request it. -Develop the conference evaluation form, collect and analyze evaluation data, and make recommendations for the following year’s HSAD. 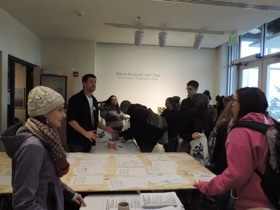 -Prepare letters of appreciation for participating art faculty and Washburn student volunteers. While at The University of Alabama Huntsville, I designed and taught a sculpture class in the theme Installation/Environmental art. 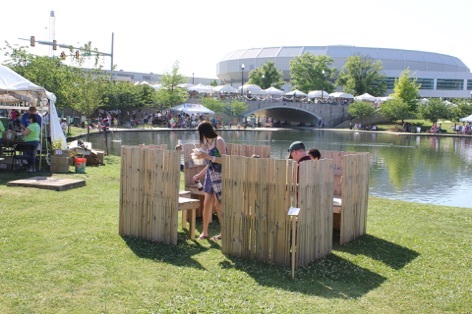 When Huntsville’s Arts Council invited the class to participate at their Panoply Arts Festival, I gave students an opportunity to entangle with new perspectives in the community and on the commons, in the manner of my work with the group Spurse. Their assignment began by considering: What do skateboarding and the evolutionary histories of how the wing developed and how the fin became a leg all have in common? Their uses created new territories. The leg’s evolution from the fin allowed creatures to crawl out of water and territorialize the land; the wing’s evolution created a new region out of the sky; and skateboarding produced a new commons out of what once was occupied space through its re-territorialization of ledges and handrails. I am currently the Catron Professor of Art at Washburn University in Topeka, KS where a major responsibility is to cultivate creative educational programs that interface communities throughout Kansas. My teaching emphasizes divergent thinking and encourages a different perspective on failure - one that rewards the search, and the generation of questions-worth-asking. I have also taught at Ohio University, The University of Michigan, and The University of Alabama Huntsville. I conceive of the studio as an analog environment that nurtures and supports students as they venture into unexpected territories, manipulate their environment, and stimulate dialogue. I approach instruction from two angles that exist hand-in-hand. One involves the logistical aspects of fabrication processes, and the other is a connotative analysis. My introductory courses focus on specific sculptural tools, materials, processes, and spatial concerns. As students advance through the program my teaching strategies expand to address conceptual, contextual, and presentational issues. Advanced courses are designed to develop an increasingly critical and analytical approach that both grounds students with historical sculptural perspectives, and supports them as they explore the expanding practices that those perspectives engage. As fledgling artists mature, I guide the serious in charting a path for their continued development after graduation. Students are required to research the language of their media, including the material composition, origins, and uses in order to be more fluent with materials and more aware of their inherent meanings. We never create ex-nihilo; and so we must take time to recognize and interrogate certainties, things we take for granted. I foster student engagement, encouraging them to share ideas, and develop meaningful relationships with them through continuous dialogue and challenging critique. Our creative practice is a praxis - action that resounds with critical reflection. It is important for me to be a working artist, continually exploring, researching, producing, and reflecting, as a way to both share my own practice with students, and welcome them into it. I am interested in how art, or any means of producing thought, can be used as a way to actively invent our world, and in courses my aim is to stimulate and nurture curiosities that encourage a crossing of domains in order to connect isolated pockets of ideas. What is unique to sculpture is that it involves pushing materials around and beyond the point where non-artists stop, as a means for greater apprehension, comprehension and modification to create new forms of thought. I then encourage students to express themselves with the conviction their discoveries have earned them. I have come to believe that it is the multiple meanings inherent in forms that give work its poetry, and so I challenge students to circumambulate objects and installations. Circumambulate comes from Carl Jung- to take something and walk around it in order to deliberately vary one’s perspective. I am not only interested in the technical quality of a work, but also in how substantive is its meaning. 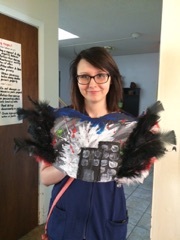 I stay abreast of contemporary practices, connect students with other artists, and am open to new ideas and collaborative work that encourages cross-fertilization outside of the department into areas such as architecture, robotics, creative writing, and the physical sciences. With collaboration, specifically, I’m interested in collapsing boundaries through sympathy, and blurring the dividing line between receivers and producers; thus favoring, instead, the perspective that receivers and producers are actually co-producing each other, which is a perspective that disrupts our normal sense of individualism and reminds of our interconnectedness. I incorporate web-based supplements to classroom instruction to enhance readings, assignments, and discussions outside of the studio, and require that students visit museums and commercial galleries to gain realistic understandings of how artists make livings. Students increasingly acquire the skills and understanding necessary for the initiation of a self-directed trajectory. No matter what form student work takes, it is crucial that it goes public. I am dedicated to providing an experience that synthesizes concepts, materials and skills in a way that propels confident, self-aware artists into the world, embracing mystery. Della Fitzsimmons builds a fence that attracts instead of divides to interrogate normative conceptions of boundaries. 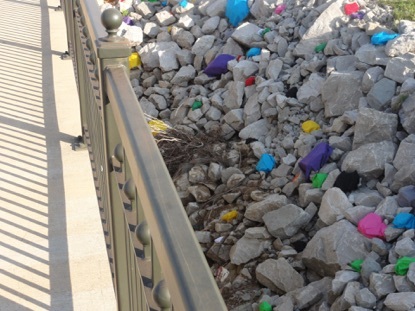 At the boundary of the festival’s closed grounds, student Alex Godbold wraps rocks and boulders with colored fabric to lead visitor eyes to the landscape underneath the highway system where the homeless are allowed to dwell, highlighting acts of exclusion.